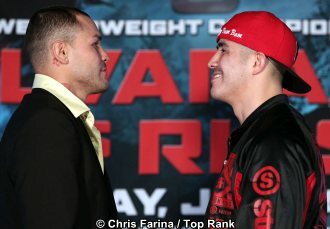 Alvarado vs. Rios 3: Who will be the last man standing? A third installment of the spirited ongoing battle between Mike Alvarado vs. Brandon Rios should be, barring a draw, decided this Saturday night on HBO. The fighter that has more left in the tank will prevail in this matchup of modern day warriors. The rubber match will take place in Denver, Colorado and Alvarado hopes this bout ends differently in front of his hometown faithful. This pair of Mexican-American boxers more than lived up to their heritage’s long history of entertaining slugfests. In their first tilt Alvarado took the early lead only to succumb to Bam Bam's pressure and power, losing by TKO in the 7th round. In their second affair Alvarado looked sharp in the opening frame until a Rios jab shook up Mike in the 2nd round. At the end of that round Alvarado was cut above his right eye and seemed already shopworn at such an early stage of the fight. In the very next round Alvarado would rally and control Rios with movement, potshots at distance, and combination punching throughout the rest of the contest. The lateral movement by Mike made it difficult for Brandon to land more than one punch at a time. Both fighters have taken their fair share of punishment within these epic two bouts. Not to mention the fights they've had before and in between, which remains a key variable when analyzing who will be victorious. Another variable when solving this equation is the focus and current mind state of both fighters. Both men have had their issues with the law outside of the ring. Mike was recently arrested and Brandon’s out of camp behavior has haunted him on occasion come fight night. The chin on Rios is a sturdy as they coming having faced the likes of Manny Pacquiao. Other contenders have caused damage but none were able to drop or stop Bam Bam. Rios was dropped twice early in his career against a non-descript opponent back in 2006. On the other hand Alvarado has been dropped, hurt several times, and stopped twice in technical fashion. So who will be remembered as the better fighter historically and who will keep their career as a top-notch contender at or around TD welterweight division? Based off their recent level of opponent and how successful each fighter was, Alvarado would have the advantage. Mike loss to the Mexican Legend Juan Manuel Marquez which is nothing to look down upon. He had a very good camp and proved that the dog inside of him still has some bite left. He was knocked down in the eighth but still managed to present a good account for himself, even returning the favor knocking down Marquez in the ninth. Lately, Rios has looked a shell of the fighter he once was. In his heyday Bam Bam would apply relentless pressure behind a power jab and that iron chin. Rios has a strong punch but has relied mostly on wearing opponents down with left hooks to the body and head. Dramatic weight gains between camps and weight loss in a short amount of time has taken its toll on his fighter spirit. It’s hard to choose a winner with one guy seemingly too far gone from his prime in Rios and a faulty chin of sorts that could spell trouble for Alvarado. Alvarado needs to rinse and repeat what he did in their second meeting by continuing to circle Brandon to offset his offensive attack. If he can limit the time he spends on inside he should be able to disarm Rios of his greatest weapons. For Rios it's simple attack, attack, attack. Will he follow Mike or can he cut the ring off on Alvarado this go round? Recently Bam Bam has looked lethargic not able to sustain his trademark hair-on-fire style. Although this fight will go both ways as far as exchanges and momentum, at the end of the night I see movement and a hometown advantage on the scorecards being enough for Mike Alvarado to win somewhere in the 7-5 or 8-4. My official prediction is Mike Alvarado by Majority Decision. Click here to view a list of other articles written by Chris Carlson.